Eat less animal fat. 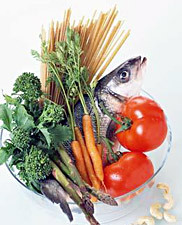 Eat more oily fish and use extra virgin olive oil instead of standard cooking oils. Top up your diet with an antioxidant supplement, including vitamins C, E, beta-carotene and the mineral selenium. Also eat plenty of antioxidant-rich fresh fruits and vegetables, especially onions, garlic, carrots, tomatoes, broccoli, cabbage and cauliflower. Eat more fibre, especially oats, rye, millet, brown rice and beans. Fibre helps to move food through the gut and may reduce the re-absorption of oestrogen. Limit alcohol, since it can cause an increase in oestrogen levels. Cut back on coffee, cola, chocolate and strong tea. Increase your protein intake. Protein is needed to build and keep muscles tone and firm. Protein also provides much-needed Collagen. Three to four meals a day that consists of protein is recommended. Another thing that is important to avoid drooping or sagging breasts is wearing a good supportive bra, especially during pregnancy and exercise.